Dave Elger on Running, Racing and Training: Pre Run Snack! Wow that looks yummy! Did you make that and if so send me the recipe. Had a nice rainy hilly run with Jonathan this morning. 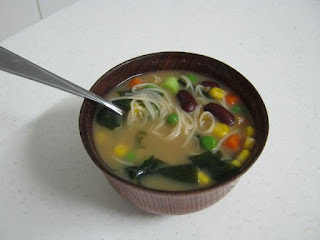 Just some veggies, kidney beans, and those thin quick cook noodles added to a miso soup packet.